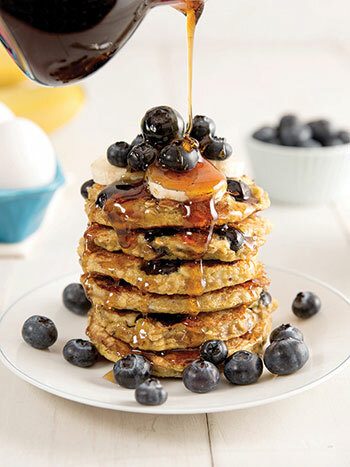 Combine banana, eggs, and oats and let stand 10 minutes to thicken. Spray a large non-stick skillet with cooking spray and heat over medium heat. Spoon mixture, 2 tablespoons at a time, onto skillet and top with some of the blueberries. Cook until browned, 1–2 minutes. Turn and cook additional 1 minute or until cooked through. Combine maple syrup and lemon zest and serve with pancakes, if desired.